A pregnant woman was decapitated last Sunday after she was attacked by a man in her home, The National reports. Lucy Evi Apini, 25, from Inawii village, Bereina, Central, was alone in her home when the 18-year-old suspect from the same village approached her and asked to light his cigarette. Police reports said while Apini was trying to give him a light, the suspect pulled out a bush knife and hit her on the back. Provincial police commander John Maru said the suspect then swung the knife at her neck and chopped her head off. He said the reason for the killing was not known but police believe Apini’s husband, Charles Aisaga, might “know something”. Police briefs said the victim was eight months pregnant when she was killed. Village councillor Joseph Ofoi said the killing had “shocked” the people of Inawii. He said the relatives of the deceased were angry but wanted the police to thoroughly investigate the matter and arrest the suspect. “This is a very sad case. I think it is a double murder as the woman was carrying an unborn child inside her when she was killed,” he said. He said the suspect was allegedly mentally retarded and was known to be a drug addict. village but police had handled the cases very poorly. He said the suspects in all the murder cases were known to the villagers but police always had transport problems and did not follow up on the cases. The matter was reported to Bereina police last Thursday and they attended to the scene, but by then, the suspect had fled. Maru condemned the killing and assured the relatives of the deceased police would use all available resource to find the suspect. A village has been razed to the ground as a result of the gruesome killing of a Grade 3 student from the Asarumba Care Centre in Bogia last Saturday, The National reports. Eyewitnesses and Bogia Mayor Felix Bangai said the 11-year-old boy and his teenage brother left early in the morning to look for coconuts. He said they had walked to the border of Kalilat village, the last village after Bogia. While trying to husk coconuts there, the brothers were ambushed by a group of Kalilat youths who shouted at them to leave. The elder brother sensing danger ran ahead of the younger one. Unable to catch up, Junior Bari Gumai of Dangale village, Manam, died while running, speared in the back with a fishing gun. The metal fishing spear had a thick metal tip fixed with a hook. The gang then took the boy’s body to the beach, burnt the face to make it unrecognisable and then gutted the corpse with a bush knife. But about 200 relatives of the deceased then marched onto Kalilat village, razing everything in front of them. They burnt houses and slaughtered animals. Kalilat villagers then set up roadblocks at three sections of the road, with women and children forced to walk while vehicles were stopped from going to or from Bogia. But Snr Constable Adam Yawing, the man in charge of the North Coast Road highway patrol saved the day by disbanding the angry Kalilat youths while asking for the surrender of the killers. An auxiliary policeman and community leader Joe Viaken said they were turned upon by the men from Kalilat when they tried to intervene. “We were being shot at with fishing guns. Almost all of them were armed and didn’t respect the law,” he said. “They shouted abuse at us and used the cover of women and children at the roadblock to attack us. “One spear landed in the car nearly killing the acting district administrator. We will be reporting the matter to the provincial police commander,” he said. Viaken said the situation was still tense yesterday after the burial of the boy. Asarumba care centre spokesman Nelson Mambote has lashed out at the government and is appealing for the government to look at relocating them to a neutral place. “This is the third death so far since we have been placed here in 2006. “The first was of a small boy. The Rarin community of Bogia killed and ate the child, cannibal fashion; the second was of a mother and child while out gardening and this is the third. “Enough is enough, we can­not go on like this,” he said. CHRIS Hulape said in a statement yesterday that a couple of weeks before their arrest, National Fraud Squad members in Port Moresby visited his Gerehu home and left a telephone landline number 325 9873, The National reports. Hulape said when he returned the call, a man answered and Hulape introduced himself and was told his call would be returned. “About half an hour later, the same person called from a bemobile number, 765 34370, and introduced himself as from the fraud squad. Hulape said when the phone call came through, he was with his lawyer Paul Yange of Warner Shand Lawyers in Kokopo and two policemen, who were present, heard the phone conversation on speaker. Hulape claimed that the caller said he would help if Hulape cooperated. He said there was a series of phone calls and text messages throughout the week from the caller asking for cash to be deposited into Westpac Bank account. Hulape said he had saved the text messages and would give them to police.Hulape said last Friday, at about 9pm, task force members interviewed his wife for about three hours. day but bail was denied her, although she was in her final week of pregnancy. ONGOING investigations into alleged misuse of millions of kina of state funds in the National Planning Department have led to the weekend arrest of a married couple in Kokopo, East New Britain, The National reports. The man was reportedly a former executive officer of former national planning and monitoring minister Paul Tiensten. Torch Bearer Productions Ltd managing director Chris Hulape and wife Agnes Frank-Hulape, who is a shareholder of the company, had been charged with misappropriation and stealing under false pretence. The arrest by the Task Force Sweep team was in relation to more than K1 million funding for a resource centre and three markets for Kiriwina-Goodenough district in Milne Bay. the Kiriwina-Goodenough Strategic Market De­velopment Project (K1 million). Police investigations had revealed that no such projects had taken place, culminating in their arrest on Saturday. Hulape, 34, of Vailala Hilo village in Kikori, Gulf province, had been refused bail while wife Frank-Hulape, 34, of Rabuana, Rabaul, was charged, detained and released as she is pregnant. Both would appear before the Kokopo District Court this morning. Operation Sweep team chairman Simon Koim said in a statement last night that the couple was innocent under the law until proven guilty. “They will now go through the normal criminal process in court to prove their innocence on the charges laid against them,” he said. Hulape was tracked down early this month after he allegedly discharged a firearm in public in Kokopo. Police are still investigating this incident and another alleged misappropriation of K1.5 million for a Gulf school. Hulape, in a statement yesterday, said the pro­ject submission for building of a resource centre and three markets were supported by a letter signed by the Member for Kiriwina-Goodenough Jack Cameron. He said the MP and the district administrator formalised the arrangement through a contract signed between Kiriwina-Goodenough district administration and Torch Bearer Productions Ltd. He said the resource centre was completed and based on Cameron’s request, the funds were released to his preferred sub-contractor accordingly. “The MP then made numerous requests for Torch Bearer Productions Ltd to off load the remaining project funds to his family company so that they could implement the market project, Hulape claimed. Hulape said a letter signed by the MP, the district administrator and district treasurer cancelling Torch Bearer Productions Ltd’s contract was sent to him saying this was because of delays in completing the project. A copy of the letter cancelling the contract was sent to the task force team. Hulape expressed concern that Koim was conducting premature investigations on some well-meaning projects secured through the national go­vernment such as his Kiriwina-Goodenough one. THE Customs Department has confirmed that the Greenpeace vessel, mv Esperanza, breached clearance conditions when it sailed to Pomio, in East New Britain, last Sunday, The National reports. Greenpeace, which has lost its charitable status in New Zealand after a lengthy investigation, faces a fine of between K500 and K25,000 under section 25 of the Customs Act. The department's trade and compliance director, Wesley Bulumaris, said the vessel was cleared to enter Papua New Guinea waters but was to sail directly to Port Moresby. "We have now come to learn through the media that the vessel sailed to Pomio rather than Port Moresby and is currently on anchorage since Sunday, Monday, Tuesday," he said in a letter yesterday to lawyers acting for landowners in Pomio who are opposed to the Greenpeace's publicity stunts and other activities. A copy of the letter was made available to The National by MS Wagambie Lawyers. Bulumaris said the captain's action was in breach of the conditions and punishable under the Act. "Investigation will be carried out to establish the facts for any action to be taken," he said. Esperanza has since left Pomio and was believed to be heading to Port Moresby with a few landowners to seek political support to stop the special agriculture business leases. A Post-Courier reporter is believed to be on board the vessel. FM 100 radio reported yesterday that Greenpeace had abandoned its activities in Pomio following protests from landowners who support the oil palm project which is expected to provide jobs, security and infrastructure, royalties and other benefits. On Monday, lawyers acting for Rimbunan Hijau (PNG) Group served notice on Post-Courier to publish an apology over a report on the same day or face legal action. The Monday report, headlined "Pro-loggers tell visitors to get out", stated that RH was still operating in Pomio despite a stop-work order and was in contempt of court. Warner Shand Lawyers said no such court order was in place and that the report was malicious. This would not be the first time that Greenpeace had broken laws to achieve its goals. Last year, its Rainbow Warrior was escorted out of Indonesian waters after the local authorities discovered discrepancies in the papers submitted by the ship's agent and Greenpeace campaigners. It’s not often you get a Huli Wigman and an Asaro Mudman running loose in one of the world’s most popular locations – the Times Square in New York. But that’s exactly what happened last week when Tourism Promotion Authority staff Oberia Ataku (wigman) and Kaleno Basina (mudman) adorned themselves in their traditional Papua New Guinea bilas and strutted their stuff along the crowded sidewalks and under the bright neon lights of Times Square. 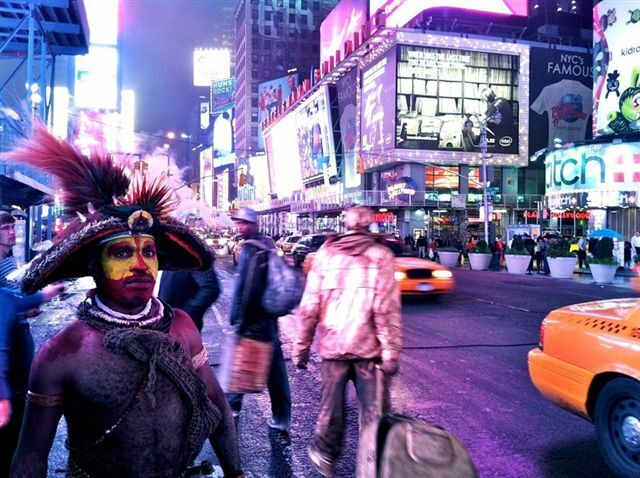 American based internet news service Absolute Travel said in its latest edition: “It’s not easy to stand out in New York City but last week, our buddies from Papua New Guinea literally stopped traffic”. The Wigman and Mudman also had wide-eyed revelers starring in awe as they strolled through SoHo’s swanky streets. 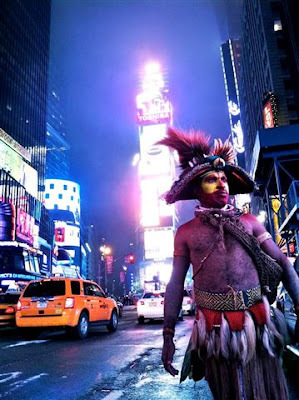 Ataku and Basina were promoting PNG in New York and the North American market as part of a media and trade seminar organised by the PNG Tourism Promotion Authority’s United States office. One of the most-respected government business executives in the country, Mewie Launa, died from a suspected heart attack in New Zealand last Saturday. Launa, who was corporate affairs manager with the Fresh Produce Development Agency (FPDA) in Goroka, died from a suspected heart attack in Auckland, New Zealand, while on a business trip. His body is in New Zealand awaiting repatriation to Papua New Guinea. The FPDA took out a full-page advertisement in The National today announcing his death, which shocked many people, given the respect he commandeered in the country. Launa was a well-known former rugby league player in Goroka and Port Moresby, and worked with Investment Corporation, Coffee Industry Corporation and FPDA. Younger brother, former Chuave MP Peter Launa, said tonight that the family was still reeling from the shock of the sudden death. “We are still in a state of shock,” he said. Launa, while with the Investment Corporation was involved in co-operative societies, for which many people remember him for. At the CIC, he was in a senior management position at a time when the industry faced so many crises such as Coffee Rust and the infamous Panga case, but helped to steer the ship through stormy waters. He employed young people from all over the country with a view towards giving a new face towards PNG’s then often-controversial coffee industry. At FPDA, which he joined after CIC, Launa was helping to set up so many vegetable projects in the country – such as the Potato Late Blight project - with a view towards the LNG project, including building of the new FPDA headquarters in Goroka, when he passed away. Ironically, he was closely involved with New Zealand Government support of the vegetable industry in PNG at the time of his death, which included him hosting New Zealand Governor-General Sir Anand Satyanand at Kabiufa in September 2009. New Zealand Herald News reported that Launa died from a suspected heart attack at a dinner before the Rugby World Cup semi-finals last Saturday. Launa, who collapsed about 7.30pm as about 500 diners sat down to eat last Saturday night, was believed to be attending dinner with his wife and other FPDA executives. Former All Black Andrew Mehrtens, who gave a speech at the dinner, said he, like many others at the dinner, was at first unaware of what was happening. "We were about to go in there and do a couple of things as part of the entertainment and then we got told that someone had possibly had a cardiac arrest but then we also got told that he'd been taken out and possibly just passed out. "We were reasonably oblivious to the gravity of it; they had the medics in there. They were working on him outside the actual function room." St John staff worked on Launa for about 40 minutes but were unable to revive him. Mehrtens, who didn't learn that Launa had died until after the function, said it was a difficult balancing act for the organisers but he believed they handled the situation well given the circumstances. "I guess the tough thing for the organisers there is being sensitive to this guy and those around him in that sort of situation but at the same time not effectively cancelling the whole event, so I think they did it pretty well," Mehrtens said. AIRLINES PNG has appealed to everyone not to pass judgment at this difficult time until investigations into the causes of the disaster have been established, The National reports. Two flight recorders, the cockpit voice recorder which records all conversation in the cockpit and the flight data recorder which records all instrument readings and other technical data throughout the aircraft, have been in Canberra, Australia, since Sunday and their contents are being examined. Together with detailed forensic investigations of aircraft parts from the crash site and other examinations, investigators ought to collect a body of evidence sufficient to piece together what exactly caused the accident. APNG chairman Simon Wild said yesterday that until that was concluded, it was premature to make any preemptory judgment that would be prejudicial to the future of the airline and its 530-member work force. At the same time, the company is making strenuous efforts to contact relatives of those who died, offer condolences and assist them. Wild spoke with staff of APNG to reassure them the company was doing everything possible to keep jobs safe and secure. “I am very aware that at a time when so many lives have been lost that the focus is on the here and now. And so it should be,” Wild said in a statement. “We are continuing to work closely with authorities to establish the cause of Thursday’s accident, and hope to receive some indication in the coming days. “We have 530 PNG nationals with Airlines PNG and I know how important those jobs are to you, to your family and to the nation. I know that the work we do is essential not only to the PNG economy but to the very fabric of our national society. “Our pilots and crew fly to and between places no one else goes, bringing cargo to people who otherwise would have difficulty receiving supplies like food and medicine. And it is absolutely vital that we all keep doing all those very necessary task into the future. The company’s 10 Twin Otter fleet is continuing to service all its charter obligations to resources companies. Wild said the companies had been gracious and trusted APNG enough to allow it to continue operations. He said for the past few days the airline had conducted extensive checks of its engineering and safety procedures prior to the ill-fated flight and was confident that all procedures had been followed. INVESTIGATIONS into the Madang Dash 8 crash has taken a bizarre twist with revelations that two of the “dead” passengers were in fact not on the ill-fated flight last Thursday, The National reports. The two, Petrus Akau and Ronald Bibi, named on the flight manifest, are very much alive, investigators have learned. Akau and Bibi had given their tickets to two other passengers who Madang provincial police commander last night named as Bernard James (for Akau) and Divu Langa (for Bibi). In its attempt to contact all 28 relatives of persons on the manifest of Dash 8 aircraft, Airlines PNG turned up two passengers whose names were on the manifest but who had given away their tickets to two other persons. This revelation further complicates the already difficult process of establishing the identity of all the 28 bodies that have been badly charred in the fiery crash near Marakum village in the Raicoast area. What do Prime Minister Peter O’Neill, Chief Secretary Manasupe Zurenuoc, National Court judge Panuel Mogish, Airbus A380 pilot Captain Locklyn Sabumei and many other leading personalities of Papua New Guinea have in common? They are all proud former students of Goroka Secondary School, one of the leading secondary educational institutions in the country, who will be putting their money where their heart is on Saturday. There are many more including leading woman engineer Finkewe Zurenuoc, Goroka MP Thompson Haroqkave, Ungai-Bena MP Benny Allan, Chuave MP Jim Nomane, former MP John Nilkare, former Police Commissioner Henry Tokam, former Chief Magistrate John Numapo, former Kundiawa-Gembogl MP the late Joe Mek Teine and many, many more, from all over PNG. They will be holding a fundraising dinner at Dynasty Seafood Restaurant, Vision City, on Saturday, October 22, to help the school raise funds to rebuild its science laboratory, which was razed by fire in June this year. The dinner coincides with another pride of Goroka, the Bintangor Goroka Lahanis, playing in Sunday’s Digicel Cup grand final, meaning the place will be chock-a-block with Goroka supporters. The school, formerly known as Goroka High School, has produced some of the finest in this country. They have all been asked to help the school at this time of need. A fundraising committee known as Asu Amiti Fundraising Committee has been set up in Goroka and Port Moresby since the burning down of the laboratory, and has already conducted several fundraising activities, which will culminate with Saturday's dinner. Sabumei, who completed Grade 10 at the school in 1982 before going on to Sogeri National High School and then University of PNG, before switching to flying, recalls that those were among the best days of his life, which made him what he is today. He admits that his interest in aviation started when he watched the first Air Niugini F28 to Goroka in 1979. 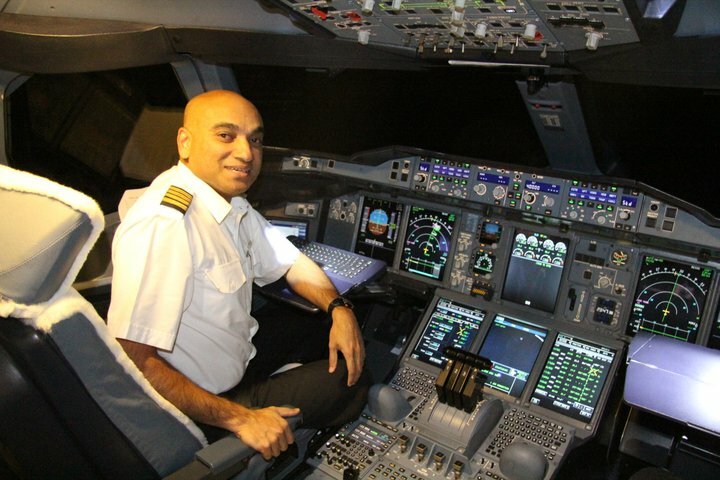 “ I enjoyed my days at Goroka High School, and it's a pity I don't have any photos from back then,” he told me from United Arab Emirates while taking a breaking from flying the mammoth super jumbo jet. “(Prime Minister) Peter O'Neill and I were in the same class. “He went directly to UPNG whilst I went to Sogeri National High School, and later met up with him at UPNG. “I remember hanging out with my boarding friends after school and waiting for dinner time, because I loved the ‘flour’ that the cooks at the mess would make. “Not the most-healthy meal by any standard, but it tasted good nevertheless! “The teachers at the school were great. “I especially remember my maths teacher in Grade 10, Sister Linda. “She was a Catholic nun from Germany that taught at the school. “Her teaching style was fun and encouraging, and she made learning maths very enjoyable. “I also remember enjoying agriculture class to the extent that I ordered day-old chicks, guinea fowls and guinea pigs from Lae, to look after in my back yard. “For a while there, I thought my calling was Agriculture. “The school also had a cockatoo that we used to take great pleasure in teaching many not-so- polite words, and for which we repeatedly got told off by the principal, Mr Egan, at morning assembly. “My interest in aviation started whilst I was at Goroka High School. “I remember the school giving us half a day off to go see the F28's first flight to Goroka, around 1979 I think. “That just spurred things along. “My friends and I would walk to the airport, and stand by the fence closest to the departure end of the runway, and stare at planes for hours on end. “All the while thinking to myself....one day I'll fly those. “Years later, when I was in Air Niugini and flying to Goroka, I saw other kids doing the same thing along the fence and thought, ‘wow...dreams do become reality’. Fundraising committee member and businessman Jeno Aeno, owner of Oxford Medical Supplies and a former classmate of O’Neill and Sabumei, urged all former students to attend the dinner. Tickets are on sale in three categories – gold for K10, 000, silver for K5, 000 and bronze for K3, 000 – while individual tickets can be purchased for K150. “I’m an ex-Goroka High School student and also a landowner from Kama village,” Aeno said. “I feel obliged that I should support the fundraising drive. “The school has produced some of the most highly-respected people in the country. “It is one of the biggest secondary schools in the country, just like Kokopo Secondary School in East New Britain and Bugandi Secondary School in Lae. “The school continues to produce brilliant students for the universities in the country and overseas. “We’re having ex-students from places like Alotau, Kokopo, Tabubil, Lae and Madang calling us to purchase tickets,” he said. “These people are going to spend their own money to fly in just for the dinner. Aeno said apart from students, many former staff would also be attending Saturday's dinner, such as former longtime principal Bernadette Ove, Karoko Asimi and others. “They are very fond of the time the spent in Goroka,” he said. Aeno said they were already assured of support from National Gaming Control Board, Post PNG, JDA Wokman, Eyechen and National Maritime Safety Authority. He is already putting his money where his mouth is, with Oxford paying for four tables at a cost of K19, 000. Former students and supporters of the school who wish to attend the dinner can call Oxford Medical Supplies on telephone 325 4874. Belden Sevua was a "political animal"